Rae Valley Heritage Association sponsored its 30th annual Nebraska State Antique Tractor and Horse Plowing Contest last Saturday and Sunday, Aug. 25-26, at Charlie’s Park west of Petersburg. The event provided a chance to get “up close” with the antique machinery and some of the animals. 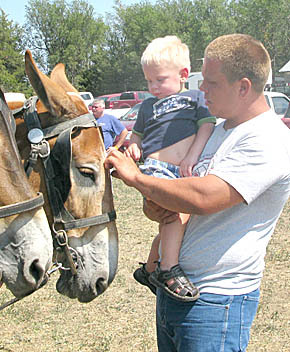 Above, a father and son took advantage to pet the mules that were harnessed to a plow. More photos in this week’s Petersburg Press and Albion News Print & Electronic Editions.